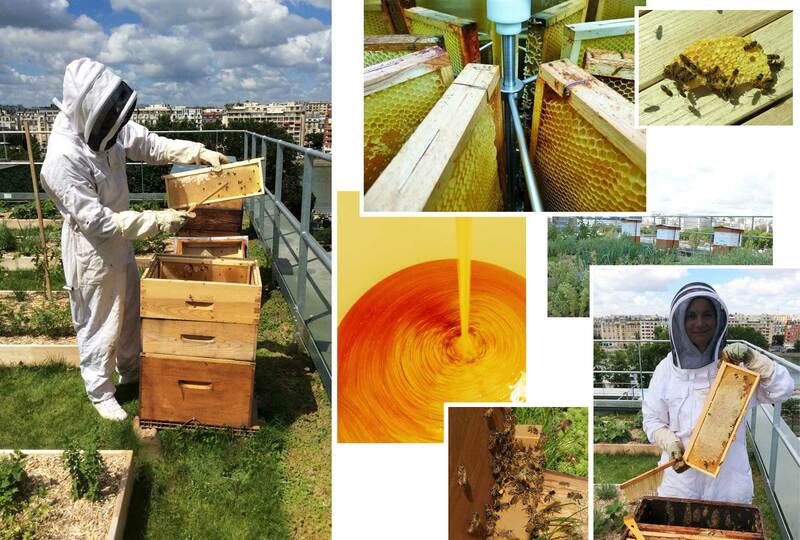 September 27, 2017 - On 11 August 2017, we accompanied our beekeeper, Charlotte Dumas (Le Miel de Paris - Apis Urbanica), and Chef Groult, Assistant Culinary Arts Director and Head of the Cuisine Department, during honey harvest on the apiary located on the vegetable roof garden of Le Cordon Bleu Paris institute. We take a look back at what harvest involves. The smoker will not be used during harvest to ensure the smoke does not affect the flavour of the honey. The beekeeper has chosen to store the sealed honey frames in airtight containers. One by one, she removes the frames of honey from the super using her hive tool. She brushes the bees who are buzzing around and places the frames in the containers. All that remains is to head straight to the honey house for the honey to be extracted! When the hygrometry rate (humidity) of the honey reaches 18% in the alveoli, the worker bees seal the cell with a small wax cap that they secrete. This process is called capping the honey. In Paris, the trees which are the most appreciated by bees for the quality of the nectar of their flowers and their pollen are the chestnut, the robinia (false acacia), lime and sophora. Other trees, such as the poplar and birch are also favourites. Is Paris honey of good quality? Yes, several tests carried out in laboratories by beekeepers or their guilds have demonstrated the quality of Paris honey. In addition, as we explain in the article “the life of a beehive”, bees have put a sort of filtration system in place. Before being stored in the hive, the nectar is swallowed and regurgitated by at least two bees. Once the honey has been harvested, we want to ensure that the bees are in good health. Charlotte, our beekeeper, begins by smoking the top of the frames to calm the bees down. This enables us to observe the bees’ behaviour and the composition of the frames that make up the hive-box. Some bees bring pollen (a source of proteins) to feed the larvae. Others feed or cap the honey alveoli. Others also take care of the brood. The predominant brood – the female one – can be distinguished from the male one (which can be differentiated by the way it looks, in relief compared to that of females and much rarer during this period). The development of the brood takes place in 3 stages: eggs, larvae, capped brood. The core temperature of the brood must be a constant 35 degrees. A moveable partition is used during winter to help the bees to maintain this temperature. The hive should never be opened during winter as this could result in the whole colony being wiped out due to a drop in temperature. On average, during beekeeping season (March to October), worker bees live for between 4 to 6 weeks. Those born in autumn are called “winter bees”, they will live for approximately 6 months in order to ensure the survival of the queen during the winter period. The queen is the only reproductive female in the hive. Worker bees have an ovarian system, but it is naturally atrophic. Once harvesting has been completed, the frames are taken to the honey house. The beekeeper will extract the honey. Emptied, but still sticky with honey, the frames will be difficult to preserve from one year to another. They are therefore repositioned on the hive in supers to be “licked” by the bees who are incredibly efficient in a matter of a few hours. Meticulously emptied by the beekeeper and cleaned by the bees, the frames are then stored, ready to be re-used during the next beekeeping season. During the 2017 Fête de la Gastronomie, Le Cordon Bleu Paris will present a round table to illustrate the theme “Products from the city centre”.